Price $6.49 US Dollars per xmas decorations graphics set - Download (see description for file format of files included). . The artworks can be used as a great source for other presets such as swatches, textures, displacements, bump maps, models and more. All royalty free, all for commercial use. Commercial use : You can use these xmas decorations resources in all your projects such as using them to create book covers, scrapbooking designs, 3D models, covers, textiles, packaging, advertising, notebooks, records, fashion designs, non registered trademarks (they are not exclusive items), wallpaper, flooring, tiles, textures and much more. There are no time limits on the use of the items. You can use them anywhere, no limits on the locations. There are no limits on the re-use of the xmas decorations nor the number of times used. All the source material is copyright of Andrew Buckle / graphicxtras.com (some items have used to public domain items from 18th century etc and this is noted in the descriptions). If you have any questions about the use of the designs, please contact us on our support e-mail. On purchase : All purchases on this site are handled by Element5 / Digital River / Shareit.com (secure connection) such as for this set of xmas decorations. Any questions about the order, please let us know. You can purchase the xmas decorations in many different currencies such as dollars, Australian dollars, Euros, GBP, Rubles, Yen etc as well as use a variety of methods such as visa, mastercard, amex, paypal etc. Once the order has been processed by shareit.com then you will be sent an e-mail with the details of the download. You can use this for a certain period of time to download your products. The designs and documentation and serials are all stored in a xmas decorations zip file and that can be expanded by most modern OS but if you can't unzip the file then I would suggest checking out tools such as Stuffit Expander or Unzip (free). PNG files : In many cases, you can use the xmas decorations PNG files (or JPG files as sometimes they are used instead of PNG files) in a variety of ways. The PNG files can be used as a source for brushes in many different applications as well as a great source for amazing patterns and seamless tiles and textures etc. The xmas decorations files are generally easy to add into the application such as via the edit menu and the define command to add the artwork as a brush stroke or pattern. All the applications are very different in their approach and if you want to find out how to do this for your application then I would suggest checking the documentation or checking out our video tutorials on youtube.com (graphicxtras channel) and you can learn of many more things to do with the artworks. You can also convert the PNG format files into other formats such as PSD and then use the artworks as a great source for displacement maps. You can also trace the xmas decorations artworks and convert them into vector designs perhaps for use as a vector shape or CSH format design. ABR : Brush format files in Photoshop and Photoshop Elements. Some of the ABR designs can be used in tools such as Affinity Photo, GIMP, PSP as well though if that is not the case then the PNG files are supplied and can be used as an alternative and added to those application's brushes. The xmas decorations ABR files are added via the brushes presets and can then be applied as a brush, art history, clone brush, smear, blur, etc. PAT : Pattern format files for Photoshop and elements and are loaded via the patterns features in those applications such as in layer styles and fill layers etc. 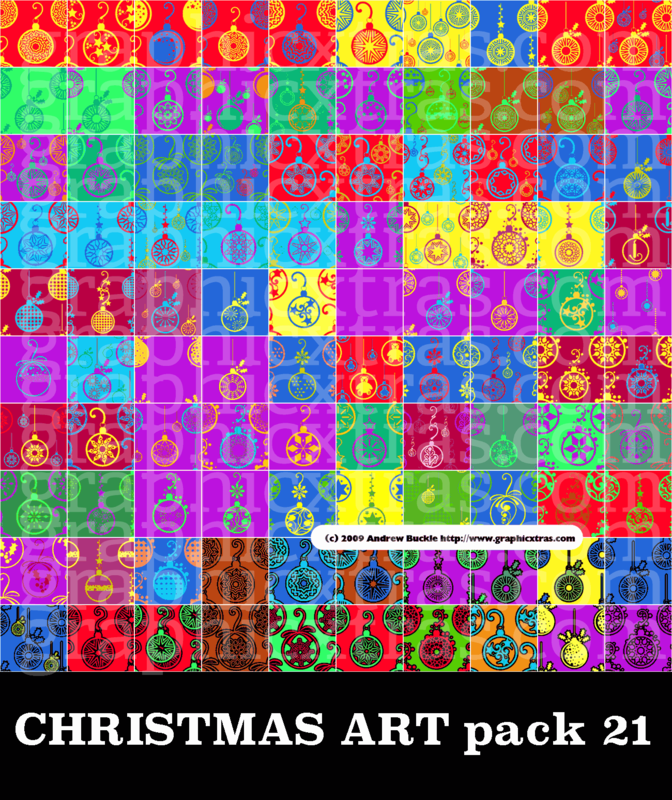 A simple set of designs can be combined and modified into millions of amazing xmas decorations pattern tiles for all your work such as frames, tiles, backgrounds, overlays, textures, surfaces and more. CSH files : This is the format for Photoshop and Photoshop Elements for the xmas decorations custom shapes and they are super easy to load via the custom shapes panel and load command. Once loaded into the panel, you can select any of the vector designs and use as a great source for new brushes as well as patterns and tiles etc. The custom shapes can be any size. You can also use the xmas decorations as cookie cutters in Elements. PDF files : These are basically the equivalent of the JPG and PNG but they are vectors and can be used to any size which can be set on import into the application (though that does depend on the application so if used in Illustrator, you can re-size and distort and use all the usual vector effects on the designs). PDF is Adobe Acrobat format and is supported by a large number of applications such as Affinity Photo, Photoshop, GIMP etc. You can use the xmas decorations designs as is but you can also use them as a source for brushes and patterns and textures and many other resources. EPS files : These are supplied in many different sets and can be used as vector xmas decorations designs in many applications such as Illustrator and Affinity Designer. You can re-size them in all kinds of ways and add effects and more to the designs. You can also use them as a wonderful source for brush strokes and tiles etc. You can import xmas decorations EPS files into many different applications such as PaintShop Pro and Photo-Paint etc. TTF or OTF files : These are fonts, just the same as Times New Roman and Arial but instead of A B C D etc you get xmas decorations designs included in each of the glyphs. Easy to add via the font panel in the control panel on the PC or via the fontbook on the mac. Access the set via the typeface dropdown. You can also access all the artworks via the glyphs panel in a number of applications making it easy to select all the designs in seconds. AI files: These are either sets of xmas decorations designs to be used as brushes in Illustrator or swatches or symbols or styles (the clue is in the product name). In many cases, you can simply open them as swatches and then drag the resources to the artboard and then drag them into the brushes or symbols and use them as a great source for those presets. You can also export the designs for use throughout the Creative Cloud either by using the export functionality or by dragging the xmas decorations to the library panel and then using the designs in After Effects and Premiere and Photoshop etc.